Taijiquan is both an art and a science. Precision postures and movement principles, deep theory and practical martial applications constitute the science. Individual human expression of the solo forms, and push-hands, or free fighting (San Shou/ San Da) becomes the art. The better the understanding and execution of the postures, techniques, and energy, the higher the level of art on display. A child’s fridge painting is “art”, but will not compare with masterpieces by Picasso, Monet or Da Vinci (except to a doting parent), because the child has not yet mastered the techniques and use of various mediums. Most Taijiquan we see today is like the fridge painting. It is recognizable but far removed from the standard of what Taijiquan should be. Many may not know the standard, not having been exposed to it. Postures may lack strength and clarity, and the energy may be stiff or, if soft, lack cohesion, and lack spirit. Basically, the principles are missing. Many wrong ideas about Taijiquan prevail, and practitioners remain content to “play a little Taiji” instead of working diligently to come closer to the standard. They learn the external movements, or, in some cases, an approximation of them, and relatively few come to fathom the deeper internal aspect of the art. The reasons for this lies with general poor standards from unqualified instruction, or students learning under a competent teacher but leaving the teacher too soon and carrying their mistakes with them. A great many practitioners only consider relaxation and fluidity, without understanding the meaning or application of the postures, or understanding that Taiji energy follows a spiral path, thus they miss the very essence of the skill! Taijiquan then becomes limited to some lightweight, airy dance movements, far removed from the skill created by a military general (Chen Wangting), passed down to generations of bodyguards and armed escorts! The energy itself only links the postures together, so if the postures deviate from the correct principles, resulting in misalignment and loss of equilibrium, then simply being relaxed and flowing, without working towards the standard will never make the skill become correct, no matter how many decades of practice undertaken. Perfect posture must be drilled until it becomes natural and instinctive. For this, it is important to seek out the best teacher available – one who can set the best example and can guide the student to develop his potential. True and deep relaxation comes through maintaining deeper postures, for extended periods of time, and greater repetitions of the form. The lower the body sinks and/ or the longer you hold the stances, the harder the legs work, and the greater internal pressure increases. You learn to relax through the pressure you create, and you have complete control over this pressure. In this way, all tension and stiffness is literally ground out, like wringing out a wet towel, until there is none left. All that remains is a strong frame and solid structure, as Qi goes to the bones and skeleton making them resilient and strong, and you come to meet the Taijiquan principle of “Upper Body Relaxed, Lower Body Strong”. Gradually, the concept of “Iron wrapped in silk”, also known as “Steel wrapped in cotton”, becomes manifest and realized. In other words, Hard (Gang) and Soft (Rou) work together, internal and external harmonize and become One, and the level of 50% Yin/ 50% Yang is attained. This process is the only way real relaxation and the right flow of energy can be attained. Those not having undergone this process, that only stroll through their forms, like a walk in the park, may sincerely believe they are relaxed, but theirs is not real relaxation, because it is not deep and permeating on the cellular level. Some individuals may exhibit beautiful form, but when engaging in Push Hands with an unknown partner, or real opponent, instantly and uncontrollably tense up and become rigid. This causes Qi to rise and loss of root strength, so they can be easily controlled, uprooted and tossed about like rag dolls. The Taijiquan principles demonstrated so perfectly in their form suddenly become scattered in the wind, once under pressure. With true relaxation, and grounding, even a light person can make himself feel infinitely heavier, solid, and immovable, like a mountain. Consider trying to lift the deadweight of a person that has fainted, and how difficult that is! Conversely, a heavy-set person can feel like a paper bag once he becomes tense, and Qi rises unable to sink, or loses his equilibrium and is led into Emptiness. Beginning from the top down, the crown of the head (Baihui) should be held upright, with the feeling as if being pulled up, and the body should feel as if suspended from it, in a sense like meat hanging from a hook. To achieve this, the chin must be tucked in slightly so the Chong (central) channel is open. If the chin juts forward the Baihui tilts backward and the Chong channel is broken. Taijquan theory holds that “Baihui leads the entire body”. The head should remain in line with the trunk, and leaning to either side will affect internal balance. The chest must be concave or hollow, empty and relaxed, so the back is convex, extended and rounded. This must be achieved without raising or hunching the shoulders, an all-too-common postural defect. When the back and chest meet these criteria Qi can sink to Dantian. If this demand is not achieved (i.e. shoulder blades are closed and the chest barreled etc.) Qi remains lodged in the chest, which causes the heart to work harder than necessary, and additional pressure on the diaphragm, affecting the breathing pattern, thereby interrupting the smooth flow of Qi. In this situation there will be feeling of slight discomfort, but most beginners, and practitioners that learn more cerebrally than viscerally, are less sensitive to their internal bodies, and often cannot always discern this, or the most comfortable, natural position. The classics of Chen family Taijiquan state, “The back must be as straight as a flagpole”. Thus, the waist can become like the axle and the hands the wheel. When everything is connected in this manner the body is able to move as one unit, just as the classics state, “If one part moves, every part should move”. “Straight” is generally taken to mean vertical, but the back may lean to the side, as in the movements such as Step Diagonally (Xie Xing), Leaning To The Side Punch, and Protecting Heart Fist, but the back should never bend forward from the waist. In this situation the straight unbroken line is formed between upper body and rear leg. Bending forward from the waist causes internal equilibrium to be lost, so the individual is susceptible to being pulled forward off-balance, or easily pushed over from behind, when the body should be able to withstand force from every direction. The vertebrae should follow the natural curve of the spine, meaning the tailbone should be slightly tucked in, and the buttocks should not spread and protrude, causing a hollow in the small of the back. The classics say, “There should be no hollows or protuberances”. Tucking to extreme, however, will cause the back to lock up, preventing the waist from turning properly. This weakness will be exposed very quickly during push-hands. There is a an internal spot where it is just right, and generally, to find this position a qualified teacher is needed. As the shoulders relax (connected to the sinking of the hips) the elbows then settle so the arms become natural and rounded, and should cover and protect the ribs. The feeling will be full and lively. The space of approximately one fist should be maintained between the armpit and body. Some say the size and shape of a tennis ball. This helps maintain the structure of roundness, and essential Peng Jin (Ward Off energy) and the ability of the arms to turn freely. The arms should be strong and full, light but not floating, and sunken without stiffness or the feeling of heaviness or pressing downward. The wrists must be coordinated with the whole body, and pliable to produce flexibility and liveliness, but not floating or weak and limp, in attempt to make the movements appear soft and fluid. The Dantian is a most important area in Taijiquan as the main energy centre of the body and the main source of power. Though by itself it has no force, when coordinated with the rest of the body it can generate a lot of power. The function of Taijiquan movement is to connect the energy of the Dantian with the rest of the body. While there is no specific demand for the Dantian, it nevertheless should feel full, comfortable, and relaxed, so, in effect it is the purpose for the rest of the body (through correct posture) to support the existence of the Dantian. The musculature surrounding the Dantian is not needed so the Dantian can relax, allowing the Qi to return to the source, and be available for use. Tension in this area only causes the Dantian to close. When Qi is prevented from going to the Dantian, it remains in the chest, causing pressure there. Chest loose and Dantian full is the correct feeling. The Dantian is strengthened by standing postures and through correct movement and alignment, in combination with deep breathing. One common instruction in Taijiquan’s postural demands is “Sung Kua”, which is generally taken to mean relax the hips. Anatomically speaking, it is the inguinal crease, where the lower front of the torso meets the upper leg, or where you bend to sit on a chair. The Kua gives the body its springiness, from which force can be pressed downwards or released upwards, and aids in generation of power, for issuing force in attack (Fajing or explosive energy). It cushions the spine from the impact of stamping, jumping, and kicking. Only when Kua is really sunk, can the waist and Dantian turn freely to absorb, redirect, and return an opponent’s or partner’s energy, This ability to turn like an axle and wheel is the means to achieve the Taiji maxim “One ounce deflects a thousand pounds”. 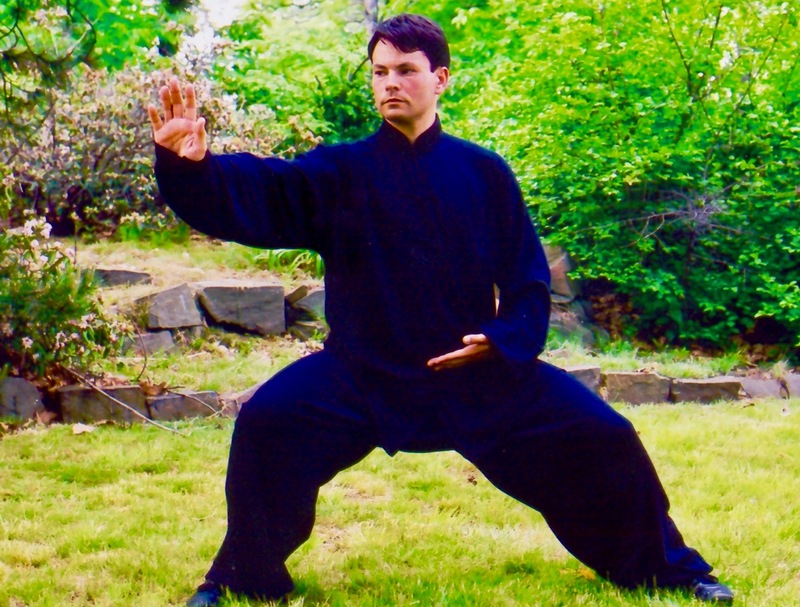 If the oncoming force to you is greater than your rooting strength and Peng Jin, and the waist is unable to turn because the back locks up, inevitably you will lose balance, and fall prey to Taijiquan’s arsenal of trips, throws, sweeps and Qin Na (joint locks). As long as Kua remains sunk and waist can turn, and you can remain calm and use “Listening Energy” (Ting Jin) then you can follow the force, and adhere, circling back in towards your opponent’s center or lead him outwards into Emptiness. Achieving Sung Kua means, as the inguinal ligament relaxes, the thigh muscles, or quadriceps, become more fully engaged, which equals harder work! This can cause the thigh muscles to burn and feel pain, and shake uncontrollably when weak, and untrained. This is just one aspect of “Eating Bitter”. Every genuine master has tasted this by the truckload. Legs are the body’s foundation, comparable to the roots of a tree, and provide the true source of strength, and power behind martial arts. A big strong tree will always have big strong roots. A true Taijiquan (or Kungfu) master cannot have weak legs. There is a saying, “Those that drink the water of Chen Village (the birthplace of Taijiquan), their legs will surely shake”. Students that seek to avoid this pain, or hard work, instinctively push the Kua out, and flex the inguinal ligament, taking pressure off the thighs. This affects rooting, and the waist and Dantian being able to turn freely through its axes, like a ball in 3-dimensional space. Sinking works a little like trying to open the lid of a jar that is stuck. You may be able to open it by running it under hot water, or sliding a knife under the lid, but without the aid of knife or water, by simply pressing down on the lid and turning, invariably it will loosen and unscrew easily. Hips and waist work the same way. Sink down and the waist and Dantian can then turn effectively. Failure to achieve or maintain Sung Kua is probably the most common postural defect in the world of Taijiquan. It is also probably the greatest obstacle in applying the skill effectively, for both martial arts and health, and coming to deeper revelations and understanding of the skill more completely. The crotch, or groin, should be rounded, so the legs, just like the arms, maintain Peng Jin. or spring-like strength. Meeting this demand is only possible through Sung Kua. This shape provides the structure so the body develops roundness and represents the Taiji symbol. This structure allows the legs to better withstand force from various angled kicks. Peng Jin is lost when the hip and knee of the trailing leg collapse inwards and point towards the ground, instead of outwards. This weak position will cause the leg to buckle against a kick. Peng Jin is also lost in bow step when the rear leg is straightened, causing the hip and knee to lock. In this situation the hips are not level (the rear hip is actually raised higher than the front), which affects the posture of the back and shoulders, and affects internal equilibrium. And, as the practitioner is not able to sit into the posture, Kua is not sunk and the waist cannot turn freely. The collapsed hip and knee offers less potential damage than the straight hip and knee, which can very easily be snapped, broken by a powerful kick. Just as a tall building needs a level and solid foundation, and strong support beams in place to remain standing upright, the body needs correct alignment for Taijiquan to be effective. The knee and foot of each leg should face the same direction. If the knee torques inwards, or is pushed outwards, increased stress is placed upon the ligaments and tendons either side of the knee. When the knees extend far beyond the toes, of the weighted leg, then the integrity of the structure is lost while greater load bearing is placed upon the joint lacking support. Over time, these defects and misalignment lead to increased weakness, and greater susceptibility to injury and persistent pain. Knee problems are a very real issue for some practitioners. Again, a good and responsible teacher will see and be able to correct this situation in the early stages, but an inferior or unqualified teacher will not even have the eyes to see. With correct Taijiquan the body exists in a perfect symmetry. Hips connect with shoulders, knees with elbows, and feet with hands. These are the “Three External Harmonies” that form part of the “Six Harmonies”. Whichever stance is adopted – high, medium or low these sets of joints should align to form a perfect frame. For example, if the position is high, the legs are in narrow stance, then the arms should be held closer to the body, so elbows and knees, and hands and feet, connect on the vertical plane, forming a small frame. If the stance is small and the arms are expansive then upper joints do not match the lower joints and the frame is not right. Similarly, as the legs adopt a wider, or deeper stance, then the arms should extend out further from the body to create this alignment of joints, and a large frame is constructed symmetrically. The very first movement in the form is called Relaxed Standing Position, otherwise known as Opening Posture or Preparation Form, whereby the practitioner opens feet to precisely shoulder width, with the weight balanced equally between them, and arms relaxed by the sides. Symbolically, this represents Wuji or Stillness, the state before Taiji (Yin and Yang), or Movement is created. More importantly, this first step allows time for a mental checklist of the postural demands and for Qi to settle and become stable. Generally, I suggest a minimum of three to five deep breaths, but you can take up to a few minutes, or as long as needed for Qi to settle and feel stable and mind to calm down. When you get into the driver’s seat of your car, you check your side and rear-view mirrors, adjust the seat and click seat belt, before driving off. Here you check that Baihui is suspended, shoulders relaxed, chest hollow, and hips are sunk etc. The mind comes to a point of inner quiet and perfect stillness, relaxed and empty, yet clear and fully aware both of internal body and external surroundings. Listening behind heightens senses and helps Qi to sink to Dantian. Qi must gather and settle at the Dantian before you recommence the form. The feeling in that area should be stable, centered, warm, full and comfortable. The Mind and Dantian connection becomes reinforced, and their communication with the rest of the body becomes enhanced. There should be no sense of impatience or rushing this process. If the Qi is smooth at the outset it should be maintained throughout the duration of the form. If this step is hurried, or by-passed, as is so commonly done, and movement begins before Qi is centered and stable, and mind calm, then the Qi will be disorderly, or chaotic, breathing shallow and erratic, and the movements will be disjointed and stiff. Those that practice in this manner, constantly, fail to grasp the essence, spirit and attitude of Taijiquan, and will never manage to attain much beyond the most superficial level of the external movements. Missing internal Stillness (in Motion) is yet another major and widespread fault. Form alone is sufficient for health, but in order know Taijiquan completely, the student must know Push-Hands. This is the means to hone and test your skill, in neutralizing and attack, to ascertain and assess any weaknesses or vulnerabilities. Remember, posture exists to support the Dantian, and as long as the equilibrium of Dantian is maintained, it is impossible to lose. When you lose it is because you become tense, causing Qi to rise (losing root connection to the ground), the back and waist lock up, so you are unable to turn adequately in order to redirect the opponent’s energy, and posture is broken. Then, you have to return to the form and the answer will be there. Practice diligently and return to your training partner or adversary and try again. The myriad health benefits and curative effects of Taijiquan have been known in China for centuries, and scientifically documented in the West for decades. The closer to the standard the practitioner is able to achieve the better the result, both for health and for martial art. Every single postural defect within the body (shoulders raised, Kua tensed, barrel-chested) essentially acts like a kink in the hosepipe, or a traffic jam on the highway, presenting a blockage whereby Qi is obstructed from flowing naturally throughout the channels. Qi is information – the message along with the messenger. So, obstructions within the channels exert profound implications on both general health, and also reaction time and execution of technique for combat. Every time just one correction to posture is applied and that obstruction is cleared, the Qi flows better and the overall situation is improved, and potential unlocked. Eventually, when there are no more blockages left, the channels of communication throughout the body’s organ networks are open and the mind and entire body can communicate optimally. No sooner has the mind sent the message and the information is transmitted to the limbs and extremities instantaneously, reducing lag time and increasing the body’s ability to neutralize force and generate power. If you do not understand the postures it is like being a tree without roots, which is prevented from growing and maturing. There is a vast different between learning the postures and actually knowing and understanding them! Once you understand, you are a tree with roots, you become strong, and then you can develop naturally and continue to refine the energy, on the right path, in the right direction, to perfecting the form.